In preparation for the 2015 SFOBA kickoff meeting Thursday January 15 at noon, hosted by Steelbridge Capital and Jones Lang LaSalle at Cypress Financial Center 5900 Andrews Avenue, here is our December recap and January preview. I also tried to include some of my own “borderline insightful” market commentary. Thursday, December 11 marked the final meeting of the South Florida Office Brokers Association for it for 2014. The meeting was hosted by Donna Korn of Taylor and Mathis, agent for Brookdale Group, owners of a five-building portfolio totaling over 400,000 square feet of Class-A Office space in Sawgass International Corporate Park. The meeting was held at Brookdale’s International Place. Our first speaker was Eric Messer, Research Manager for Newmark Grubb Knight Frank. Eric gave us a brief synopsis of the overall state of the office market. The news was very bright for the market as 2014 is shaping up to be the best year since 2005. Approximately 685,000 sq. ft. of office space was absorbed in 2014 in Broward County, reducing vacancy rates from 15.0% to the current 13.4%. An interesting observation was that the Class B market was unusually strong, which according to Eric is the result of tenants being priced out of the Class-A market. This assertion was further supported by our panel discussion. The December meeting featured a panel discussion featuring three top brokers in the market..The panel consisted of Scott O’Donnell, a CBRE investment broker specializing in private equity investments, Caroline Fleischer, a tenant representation specialist at Cushman and Wakefield and Chris Gallagher, a leasing specialist for Duke Realty. The panel was moderated by Paul Marko, President of Stiles Realty. According to Scott, we are in the third strong year of a robust investment cycle. We are seeing a new layer of foreign investment as the market’s strong demographics are attracting funds from Latin and Asian sources. It does seem however, that many domestic investors are being priced out of the market due to the demand from these offshore sources. 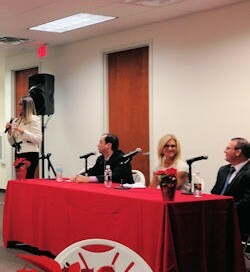 Caroline discussed the vibrant CBD market in Fort Lauderdale. Properties along Las Olas Boulevard have seen net rent increases of $5-$10 per square foot over the past 12 months. Downtown tenants are urged to jump on leasing opportunities as spaces are disappearing rapidly and rents continue to increase. Chris Gallagher concurred with Caroline’s assertions, saying that he felt bad coming up with higher rates and fewer concessions in his Weston and Plantation properties. He felt like he was taking the first born from brokers with whom he had grown up in the business. But that is where the market is today. This led to the inevitable question of whether the market is right for new development. According to Gallagher, Duke has recently signed 100,000 sq. ft. of leases in Weston and he could use a new building to lease. Caroline believes that we are 12 months away from needing new space in Fort Lauderdale CBD. But here’s the interesting piece that will have a major impact on the near term future of the office market. Residential developers will pay three times what office developers will pay for sites. With this price difference, as well as the pre-leasing requirements demanded by lenders, new office development may very well lag behind demand. Therefore, we can expect a trend of increasing rental rates and declining vacancies over the foreseeable future. Other key trends in the market discussed by the panel included the trend toward urbanism. Fort Lauderdale has seen increasing residential development in the downtown core and the upcoming wave streetcar project will soon provide a mass transportation alternative. With millennials expressing a preference to live and work in an urban environment, the CBD should remain red hot. The panel and our host Donna Korn also pointed out the strength of the West Broward market which has been enhanced by the completion of the new express lanes on I-595 that are reducing travel times for commuters. In addition new mixed use projects such as Metropica will continue to draw residents to the western submarkets. Our kickoff meeting for 2015 will be held at Cypress Financial Center in Fort Lauderdale’s uptown market and will be hosted by Sandra Andersen and Chase Kulp of Jones Lang LaSalle. Our guest speaker will be discussing All Aboard Florida, the proposed high-speed rail system that will be connecting our state’s major markets. Stay tuned to the SFOBA blog as we continue to keep you updated on trends in The South Florida office market. And special thanks to Joanne Diaz and Ted Harris who do such a great job in creating programs to keep South Florida’s office brokers connected and informed. 2 Comments on "SFOBA December Recap and January Preview"
Thanks Ted – we appreciate all comments – the first purpose of the blog is to inform, The second is to encourage 2-way communication. We’re looking to stimulate discussion both on the blog and on the Linked-in group. We’re also looking for more contributors – will address that in my next post.